ISKCON-LONDON HOSTS QUARTERLY INTERFAITH MATTERS MEETING ISKCON-London hosted faith and community leaders of Westminster at the quarterly Interfaith Matters meeting on Tuesday 29th January. Temple President, Jai Nitai dasa and Temple Secretary, Bhava Bhakti devi dasi attend these meetings, held at different venues each time, to discuss ways to work together, and topics and issues in the political environment that can affect faith communities. The agenda included: • Jai Nitai dasa reading Srimad-Bhagavatam Canto 1, Verse 1 purport on the supremacy of God and what an excellent creator He is • A discussion on the faith sector’s provision of winter night shelters and services to undocumented migrants • A discussion on how preparation for Brexit was affecting religious communities. Interfaith Matters convenes a forum for clergy and faith representatives in the south of Westminster. The forum includes Bahá’í, Buddhist, Christian, Hindu, Jewish, Muslim, and Sikh members. FOURTH ANNUAL INTERFAITH CONFERENCE AT ST GEORGE’S UNIVERSITY On Monday 18th February, St George’s Krishna Consciousness Society hosted their fourth annual interfaith discussion. The panel consisted of representatives from Christianity, Islam, Sikhism, as well as Krishna Consciousness (the latter represented by Dan Cockram, a monk from ISKCONLondon). The panelists discussed why bad things happen to good people and they were able to find parallels between the faiths. The student audience found the event very insightful and are looking forward to the next interfaith event. 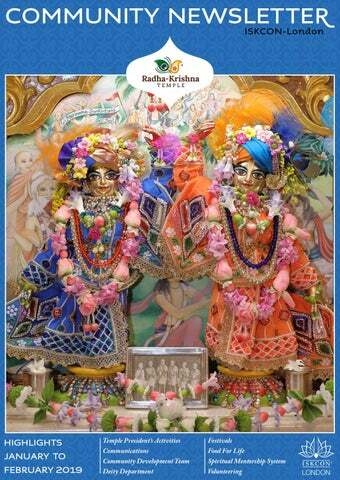 The Things to Do in London website’s “27 Things to Do in Soho” featured ISKCON-London. Consciousness when representatives arrived in the UK in the 1960s. LAUNCH OF KRISHNA CLUB Krishna Club officially launched in January. Taking place on Sunday afternoons, the club is attended by approximately 15 to 20 children each week. The syllabus started with the “Das Avatars”, the ten incarnations of the Supreme Personality of Godhead. Children start each session with learning and reciting prayers and doing some simple yoga exercises, before then being taught about one of the Das Avatars each week in an interactive way. Their remembrance of what they have learnt is then tested in following weeks via quizzes etc. During January and February, Indu Belchandan and Panchali Kar have served as teachers, and Jennal Amin has served as a Teaching Assistant. owards the end of January, Murli Manohara dasa, Head Pujari, went to Mayapur, India, for his annual service as one of the facilitators of the Temple Worship unit of the Mayapur Academy Diploma in Arcana. This unit aims to give devotees an introduction to the knowledge, skills and values of Deity worship that will help them to understand and appreciate it as an integral part of the philosophy and practices of devotional service, and to assist them in carrying out the basic items of daily Temple worship. ome rain or snow, thousands of Londoners in need are getting a nutritious meal throughout the year as a result of the Food for Life initiative. Prasadam cooked in the Govinda’s Restaurant kitchen has been feeding the homeless for over 25 years. It is run solely by the help of dedicated volunteers and a humble handy van. However, with the van coming to the end of its life, the meals-onwheels are sadly at risk. The team needs help to continue driving this humanitarian mission to help the needy. £15,000 in donations is needed for a new van for the Food for Life project and support is required to make this happen. THREE WAYS TO DONATE: www.facebook.com/groups/foodforlifelondon www.iskcon.london/ffl-fundraiser At Radha’s Boutique, by visiting in person or calling on +44 (0)207 437 3662. Every contribution, no matter how large or small, will make a difference! to apply the key teachings of the Bhagavad-Gita in modern life. esident monk, Dayal Mora dasa, officially took on the role as coordinator of the Outreach department. Amongst other achievements, he has helped shape the new series of newcomer programmes that come under the Bhakti Yoga London brand. These weekly events have been well-attended. Ladies Sanga As well as the usual kirtan and prasadam components of the Ladies Sanga, highlights from January and February were: • Keli Vrindavan devi dasi led a session on “The Holy Names” • Hanel Gir conducted a session on “Goal-setting in Spiritual Practice” • Narada led a session on “Trinad Api Sunicena” • A Krishna Conscious movie night • Ladies night out at the Healthy Wealthy devotee-run restaurant. It is particularly pleasing to welcome someone fresh off the street from sankirtan, particularly during the extra efforts made during the marathon. It is equally rewarding to welcome those from our other weekly programmes which nourishes our family relationships throughout the Temple. One service seamlessly compliments and nourishes another. This was particularly apparent during the Sunday Secrets from the East programme. The team had the opportunity to serve so many people from a diverse variety of walks of life. A full house comprising of one lady from yoga class on Friday, one from Wisdom Wednesdays, relatives of two of our resident monks, as well as new faces and more familiar regulars came together on this lovely evening – sharing tea, cake and spiritual realisations. How does one cultivate a relationship with and knowledge of God? Time, dedication and practice. Resident monk and main speaker, Dan Cockram, made a succinct analogy – that of an athlete. An athlete cannot simply walk onto the pitch and play a top game. He must endeavour. Similarly, we must follow a system to learn who is God. Present in the group was a baker who revealed (with a little embarrassment) that she often prayed to God during cooking that her bread would come out nicely. She was pacified by the speaker at the description of our process for offering everything we make to Krishna. She was gently encouraged to take a moment to appreciate and meditate on the fact that every ingredient in her baking preparation was given by the mercy of God and that going forward, perhaps before delving in to eat, it could be offered to Him beforehand. To which she enthusiastically agreed! Another topic of interest was the form of God. One devout Christian was enquiring how it is that we see God as a person. Answered expertly, with bonafide quotations from our Acharyas, Dan described the three stages of God realisation, namely, Brahman, Paramatma and Bhagavan. This particularly pleasant spring evening, the newcomers programme concluded with the discussion that all religions of innumerable variety, at the core are trying to teach one how to understand God. Krishna Consciousness beautifully engages all aspects of life in devotion to God, including the consumption of food, the dovetailing of all talents, and emotions. As such, we follow a perfect and complete system. radhaâ&#x20AC;&#x2122;s boutique spring clearance sale! regional ISKCON Canterbury On Saturday 2nd February, more than 30 people attended ISKCON Canterburyâ&#x20AC;&#x2122;s weekly nama-hatta programme to hear Jayadvaita Swami speak. esident monk, Dayal Mora dasa, is a member of the Brahmacari Council and the latest recruit on the Board of Mentors. Here is a brief chat between Bhava Bhakti devi dasi and Dayal Mora dasa regarding his mentorship and outreach services. your new role as Head of Outreach? you for your time. I understand you are off to Mayapur, India soon and so safe travels and we look forward to seeing the new initiatives you have planned when you get back. volunteering Volunteers Corner Name: Rajiv Nandha Profession: GP Pharmacist Volunteering at ISKCON-London since: 2017 What service/s do you do at ISKCON-London? I help with Food for Life and coordinate the fundraising for Food for Life. How did you get involved with it? be the best option going forward due to the benefits mentioned above. Working in conjunction with the rest of the Food for Life team and Temple management, we decided to start fundraising for a new food van and slowly came up with fundraising initiatives which we are now in the process of implementing. What do you like about your service? Everyone is so sincere and dedicated to serve Krishna at the Temple and this really motivates you and keeps you moving forward. It inspires you to try to do something pioneering which can help the pure devotees with their service. I have learnt so much whilst serving, especially the importance of building relationships. One of my favourite quotes from Radhanath Swami that has really resonated with me is, “Srila Prabhupada was happier if everyone sold 1,000 books together rather than one person selling 1,001 books.” The quote epitomises the importance of working as a team in order to serve to please Srila Prabhupada. I have always wanted to help serve with Food for Life as I felt it would be a very rewarding and satisfying experience. So I decided to spend my birthday volunteering instead I love the inspiration and encouragement from seniors at of the usual celebration of a cake, dinner and party the Temple and it really drives me. They mentioned how with friends and family. It Shyamasundar Prabhu talked was a Tuesday evening and “Srila Prabhupada was happier if everyone about Srila Prabhupada I enthusiastically arrived at sold 1,000 books together rather than one stating that we should aim the Temple after work. Just for the rhino, and that in person selling 1,001 books.” as I entered the downstairs itself is very inspiring – to reception, to my delight there was maha cake laid out on think that anything is achievable when done for the the reception desk! I thought this was rather amazing – purpose of pleasing Krishna. So even if that means aiming it was like Krishna had remembered my birthday on the for something that on the face of it appears substantially day I went to serve Him! Is this Krishna lila or maybe just quite unattainable and unique – to get Europe’s first ever a coincidence? Either way, I was thrilled to enjoy some electric food van – “The Eco Van” – which serves food to maha cake on my birthday! the homeless whilst causing zero harm to Mother Earth It was a typical winters evening in London – cold, wet and (Bhumi Devi) so be it, after all that was Srila Prabhupada’s dark as we sat in the back of the Food for Life van en-route mood to aim big and high for Krishna. to Lincolns Inn Field in Holborn. I just about managed to hold the tea pots, khichari and table together whilst the van made each turn. As we arrived at the location, a congregation of approximately 150 people waited patiently in the rain for their daily meal. We set up the table outside and took out the food ready to serve in spite of the rain. The cake, tea and khichari gradually started to get wet and soggy but in spite of this, none of the people complained. Everyone very humbly and gratefully received the transcendental prasadam, prepared at Govinda’s. I really enjoy the fundraising work, reaching out to people and showcasing what great humanitarian work the Temple does to serve the community. Naturally, people always ask what the source of that compassion to serve is, and of course the answer is always…Krishna! I am most excited about taking part and raising money for Walk Against Hunger in the summer. 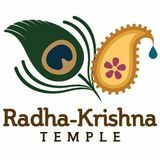 This is a 10-mile walk which symbolises Prabhupada’s mission that no-one should go hungry within a 10-mile radius of an ISKCON temple. We plan to take prasadam parcels whilst we walk too. 50TH ANNIVERSARY Team Meeting with Sacinandana Swami On Tuesday 8th January, the 50th Anniversary External Events Team had the inspiring opportunity to meet with Sacinandana Swami to present and discuss plans for the year ahead for the summer and winter events. Sacinandana Swami has a wealth of knowledge and experience in connecting to people from all walks of life and especially in inspiring western outreach. He was very encouraging and a thought-provoking discussion was had on the importance of follow-up to events and the true spirit and practical considerations of collaboration with the wider community. 50th Launch Film On the auspicious occasion of Nityananda Trayodashi, ISKCON-London’s 50th Anniversary was launched with a promo film providing a look into what’s coming up over the year: http://bit.ly/50thyearlaunch Srila Prabhupada was a pioneer of the sankirtan movement in the western world. Nothing was impossible for him and he instilled this idea in the hearts of his disciples. Plans are underway to celebrate this milestone year in this pioneering spirit. These are times when items are offered for the pleasure of the Deities. These are times when the curtains are open and the Deities can be seen. 13:00 to 14:00 Introductory talk and lunch. SUNDAY FEAST PROGRAMME 15:30 to 19:30 Includes arati, introductory talk and feast.